We are currently recruiting for the position of Chief Executive Officer (CEO) to drive our organisation to achieve this vision through our strategic directives. The Chief Executive Officer (CEO) will be accountable to the Mamu Health Service Limited Board of Directors for the leadership, efficient and effective management of the organisation according to strategic directives. The CEO will also be responsible for ensuring the legislative and funding requirements are met including appropriate financial, human resources, infrastructure, continuous quality and service delivery programs are in place to deliver high quality Comprehensive Primary Health Care. 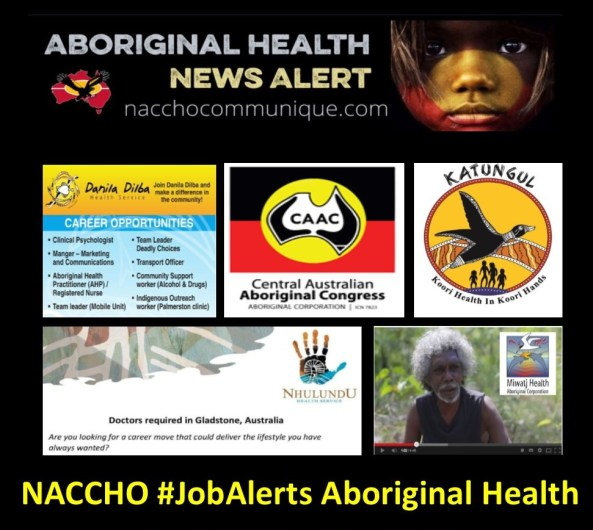 We are looking for someone who has a passion for the promotion of health care within Aboriginal and Torres Strait Islander communities, and is committed to the sustainable and long-term growth of the organisation. This is a full time position located in the town of Innisfail. The successful applicant will be required to live within the Innisfail community in order to work and collaborate with the Board of Directors, as well as develop a strong network of relationships throughout the health industry and communities. All applicants must be willing to undertake an AFP Criminal History Check, and must hold a current Blue Card with Commission for Children and Young People and Child Guardian. To apply for this vacancy, a full application package can be obtained from our website on www.mamuhsl.org.au, or please don’t hesitate to contact Jenna Pensini from Human Resource Dynamics on 07 4051 7307 or jenna@hrdynamics.com.au to register your interest. Applications close 5.00pm Wednesday 8th November 2017. Under section 25 of the Anti-Discrimination Act 1991, there is a genuine occupational requirement for the incumbent to be of Aboriginal and or Torres Strait Islander Descent. 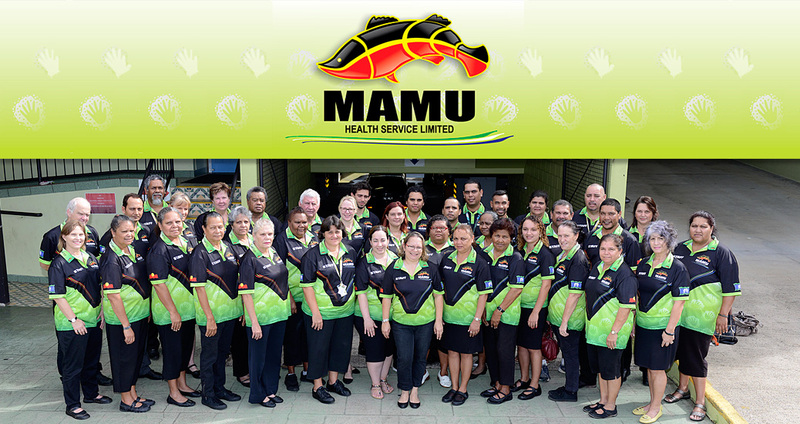 We are an Aboriginal Community Controlled Health Organisation, you will join a multidisciplinary team where you will provide professional social work services whilst working in a supportive environment. 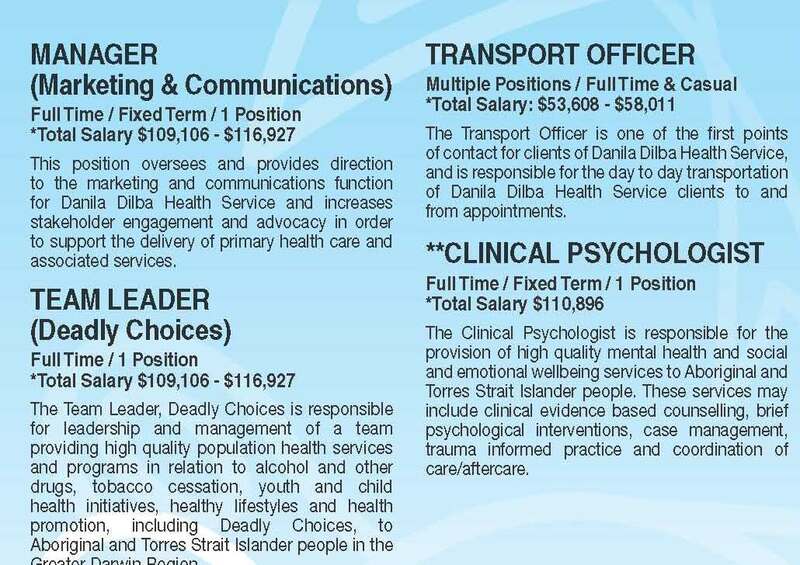 If you are passionate about improving health outcomes for Aboriginal and Torres Strait Islander people through counselling services for our community experiencing mental health, then we would like you to join our team! You will provide support, counselling and other intervention strategies to enhance individuals wellbeing. The Aboriginal and Torres Strait Islander Peoples’ Program National Manager plays a central role in planning, managing and delivering programs and developing strong partnerships with Aboriginal and Torres Strait Islander communities. The Aboriginal and Torres Strait Islander Peoples’ Program sits within Oxfam Australia’s Program Section and is responsible for setting and delivering on our strategy to work alongside Aboriginal and Torres Strait Islander organisations, communities and individuals. The program collaborates with and supports the voices of Aboriginal and Torres Strait Islander people to bring change in their lives and communities. 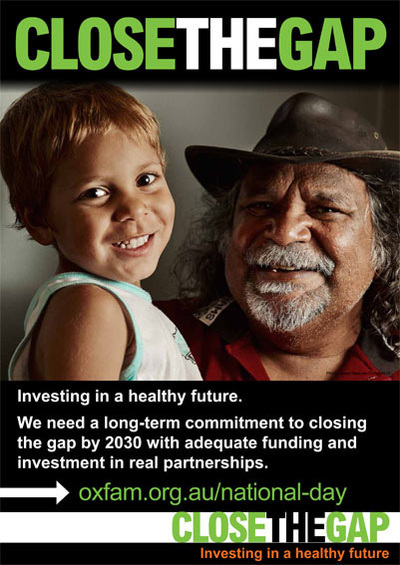 Having worked for more than 30 years to support self-determination, Oxfam Australia is seeking a committed leader to lead the Aboriginal and Torres Strait Islander Peoples’ Program’s team in strategy development, program funding, awareness raising and to develop and maintain relationships with a wide range of internal and external stakeholders. This is an Indigenous Identified role and is part of Oxfam Australia’s commitment to creating a culturally competent and diverse workforce. We have a number of measures in place to support our Indigenous staff including an Aboriginal and Torres Strait Islander Employment Strategy, RAP and cultural protocols. This is an Indigenous Identified role only open to Aboriginal and Torres Strait Islander peoples. The filling of this position is intended to constitute a special measure under section 8(1) of the Racial Discrimination Act 1975 (Cth), and s 12 of the Equal Opportunity Act 2010 (Vic). Appointment to this position will require a satisfactory clearance of a police check and/or Working with Children Check. Oxfam Australia is committed to the safeguarding of children and young people. To be eligible for this position, you must have the legal right to work in Australia. 4. Scholarship opportunity, the Australian Hearing Aboriginal and Torres Strait Islander Master of Audiology Scholarship. The scholarship, valued at $15,000 over two years, will recognise and support Aboriginal & Torres Strait Islander students enrolled in the Master of Audiology at Flinders University. 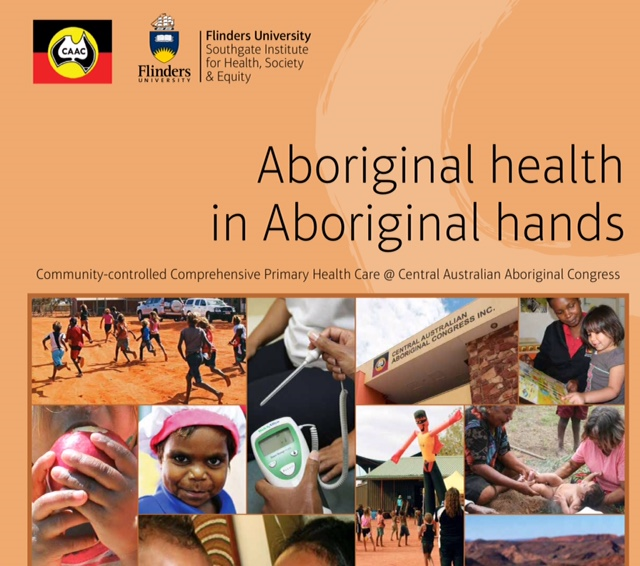 Its main purpose is to encourage individuals of Aboriginal and Torres Strait Islander background to study audiology and to enter the profession, which we feel is a very worthwhile goal. Please note: In order to be eligible for the scholarship, applicants must first have gained admission to the Master of Audiology, through the normal competitive entry process. Applications for the Master of Audiology for the 2018 intake close on 6 November 2017. 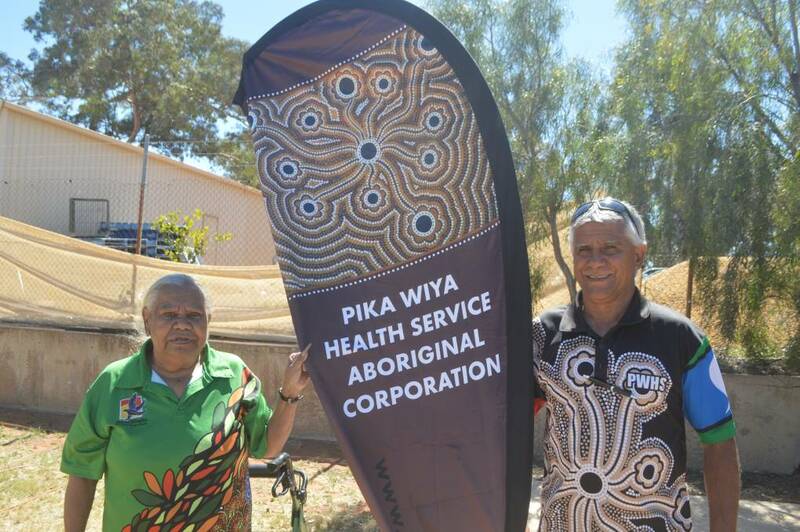 Established in the early 1970’s, Pika Wiya Health Service Aboriginal Corporation provides culturally appropriate, comprehensive primary health care services, social support and training to all Aboriginal and Torres Strait Islander people. The organisation operates from its premises in Port Augusta and also has clinics at Davenport, Copley and Nepabunna communities. 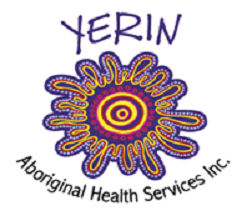 Pika Wiya Health Service Aboriginal Corporation also provides services to the communities of Quorn, Hawker, Marree, Lyndhurst and Beltana. 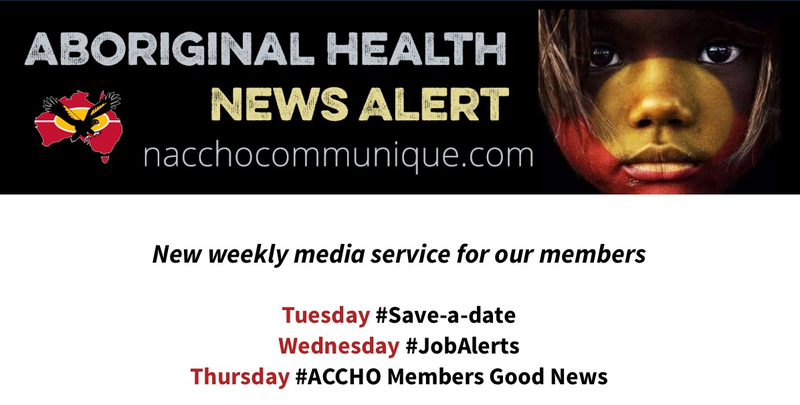 Pika Wiya Aboriginal Health Service Aboriginal Corporation (Pika Wiya) now has a full-time opportunity for a Senior Rural Medical Practitioner to join their team in Port Augusta, SA. Reporting to the Medical Director, you will be responsible for the provision of high-level primary health care, ensuring continuity care for individuals, and for prevention programs for the population. This will be done primarily through the Port Augusta clinic (bulk-billing clinic) – servicing a combination of booked and walk in clients – and also by visiting a remote clinic once a month. To be successful in this position, you will hold an AHPRA recognised medical degree including general or specialist registration and a Medicare Australia Provider Number. You will also have demonstrated experience working in a medical practice and have the ability to provide high-quality clinical skills in a rural general practice. Additionally, you must have a good knowledge of the Australian health system and the Medicare billing system. 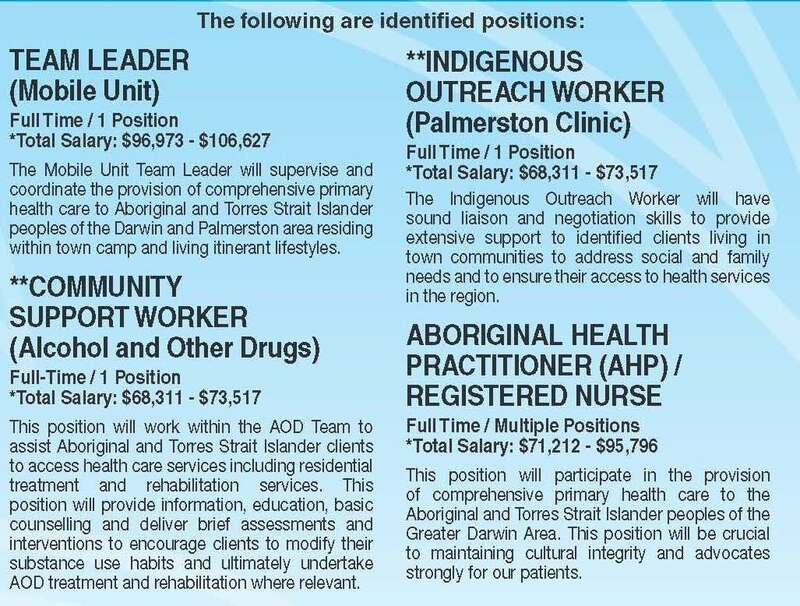 It is crucial to this role that you have a good understanding of Aboriginal community and health and be willing to involve yourself in the community. In return for your hard work and dedication, you will be rewarded with an attractive base salary of $225,000 plus super. You will also be eligible generous salary packaging, up to$16,000 through Maxxia, to increase your take home pay! Pika Wiya is also willing to negotiate relocation assistance and accommodation subsidies for the right candidate. Make a real difference to the health and well-being of a vibrant community – Apply Now! 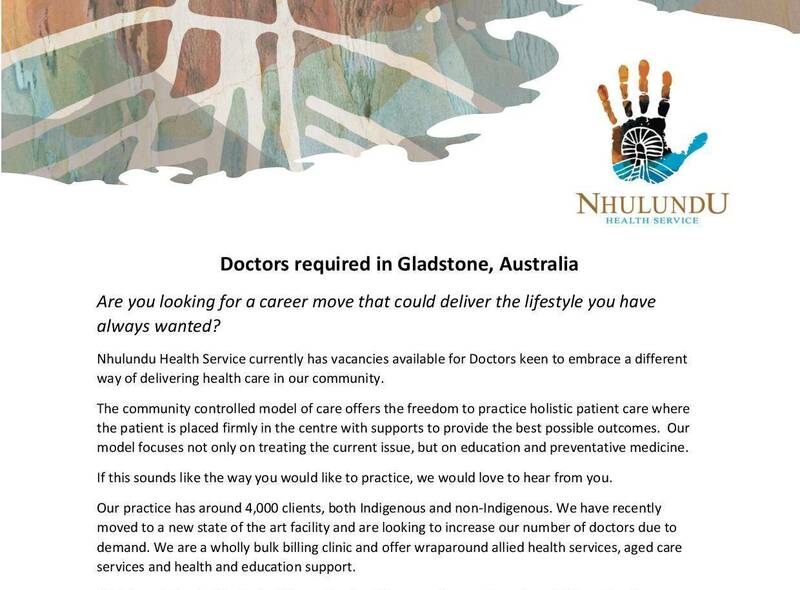 Nhulundu Wooribah Indigenous Health Organisation Inc. (“Nhulundu”) is an Aboriginal Community Controlled Health Service delivering an integrated, comprehensive primary health care service to the whole Gladstone community. Services include; bulk billing GP services, chronic disease management program, diabetes education, health promotion programs, mums and bubs clinic, aged care and community support service functions. This is an exciting opportunity to join an enthusiastic and committed team and make a direct impact on improved health outcomes in the community. 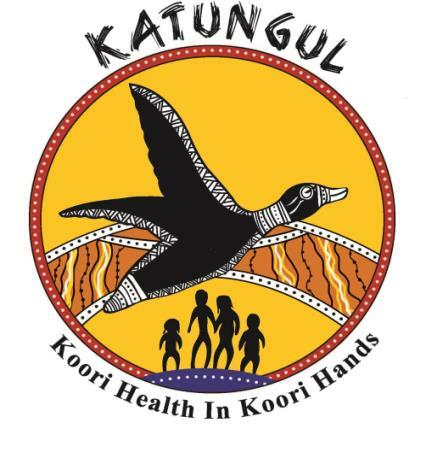 Katungul ACCMS is an Aboriginal Community controlled corporation providing community and health services to Aboriginal Australians located in the South Coast of NSW. Katungul has recently been recognised for its excellence in business in the Eurobodalla and Far South Coast NSW Business Awards. The role will involve working with a multi disciplinary team of health workers and other staff to provide culturally attuned, integrated health and community services on the Far South Coast of New South Wales. Applicants will ideally be fully accredited as General Practitioners with experience working in an Aboriginal Medical service. However other General Practitioners who do not meet this criteria will be considered. Remuneration and terms of employment will be negotiated with the successful candidate(s). Are you reliable, self-motivated and hardworking? 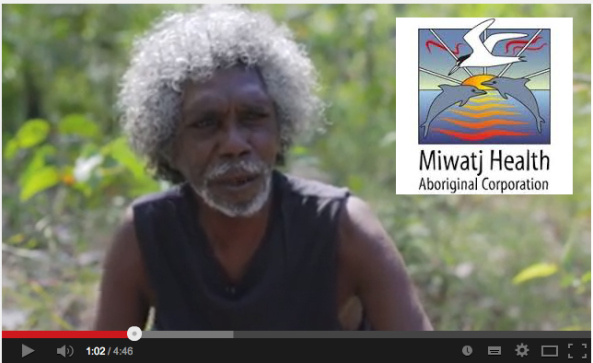 Do you want to make a difference to Indigenous health? You will work with individuals, clients, families and communities to help quit tobacco use. You will deliver and promote healthier life choices and encourage smoke free behaviour. You will report to the Coordinator TIS on progress and issues. You will need to maintain confidential client information, have the ability to speak and understand Yolngu Matha and have a good understanding of Yolngu kinship and traditional systems. You must have a current NT Class C Drivers License and a current Ochre Card (or the ability to obtain one). We are a tech charity focused on building software that supports people to change their relationship with alcohol. We support the largest community in the country focused on this social problem and we continue to grow rapidly. Our product, the Daybreak app, offers live text-based coaching alongside a supportive community and science-based exercises. What is a Daybreak Coach? A Daybreak Coach is a person that helps our members uncover and operationalise health related goals, build and maintain motivation, and identify barriers to overcome them; all of these with a focus on changing a member’s relationship with alcohol and enhancing wellbeing. Daybreak Coaches are experienced and trained in our process of changing people’s relationship with alcohol. They do not limit conversations to alcohol consumption, but do not explore topics more suited to therapy or completely unrelated to alcohol behaviour change. When these topics come up, a Daybreak Coach will facilitate the right kind of support for our members. Daybreak Coaches are not there to supplant crisis lines or clinics. When possible they will endeavour to direct members to this kind of support, but are not equipped to deliver it. Assist in the creation of scripts, guidelines, proactive scenarios and conversation prompts. Comfortable working at the fringe of mental health intervention technology.